The Dames are always up to something - whether it’s working with other podcasts to run special episode events or teaching kids how to play D&D. Check out some of our highlights below. Want to feature the d20 Dames in an upcoming story or episode? Send us a note at d20damespodcast at gmail dot com. This holiday season, you’ll probably need a moment or two to take a quiet break from the chatter and bustle of a packed house. Five actual-play Dungeons & Dragons podcasts, all helmed by women, have prepared four special crossover episodes just for those escapes! It’s their gift to you this holiday, and you can download and listen to the first “Feast of the Moon” episode right now. In the Video & Audio Highlights section (page 14) the streaming show Clerical Error is featured - the show recently wrapped it’s first season. It’s DM’ed by Lauren “OboeCrazy” Urban and stars d20 Dames own Meris Mullaley. As fans of D&D know, the live play podcast community is dedicated to producing tabletop roleplaying sessions so people all over the world can enjoy the wonders of collaborative storytelling in audio form. The wonderful gamers behind d20 Dames recruited a bunch of amazing creators to jump into producing these audio adventures set in the world of Ravnica. With Guildmasters’ Guide to Ravnica coming to game stores November 9 and available everywhere November 20, Podcasts of Ravnica will hopefully serve as an introduction to the lore of Magic: The Gathering for D&D players and to the storytelling mechanics of D&D for Magic fans. DM Kat Kruger is featured in this article (along with partner Chris Tulach) about using Magic Cards as D&D items - a mechanic featured in their Magic/D&D crossover adventure Plane Shift: Ixalan. 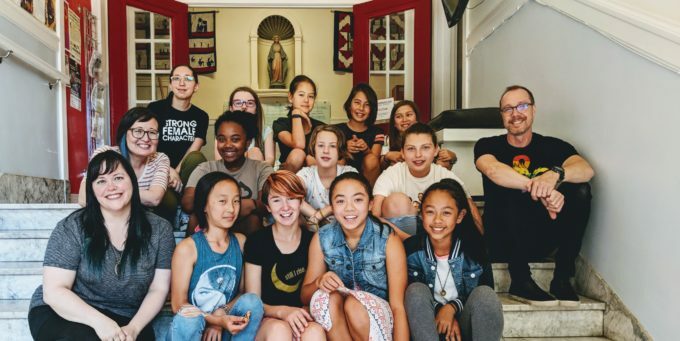 Featured in this article is Ethan Schoonover who runs a D&D summer camp and club during the school year for girls at a Seattle Middle School where he teaches. For the one week summer camp Ethan brought in familiar faces like d20 Dames’ Kat Kruger and Jen Vaughn! You might remember reading about the Dungeons & Dragons after-school club at a Seattle girls middle school earlier this year. Just because school’s out for summer, however, that doesn’t mean that the D&D fun has to stop! Teacher Ethan Schoonover and his camp co-teachers Hadeel al-Massari and Kat Kruger welcomed the girls back to school for an incredible week of RPG-themed activities and, of course, gaming sessions. DMs Guild Adept Shawn Merwin looks at creators populating the continent of Chult and highlights design tips culled from other amazing campaign content. Featured in this write up is Kat Kruger’s Trouble at Tresendar Manor adventure. Last year, to celebrate the release of Tomb of Annihilation, we collaborated with D&D liveplay podcast producers to create episodes using material from the adventure and released them on the Dungeon Delve podcast feed. Victoria Rogers, from the Broadswords, ran with that idea and brought together even MORE podcasts to create one-shot adventures using monsters, stories and lore from Mordenkainen’s Tome of Foes, coming out in game stores on May 18th and everywhere else on May 29th. 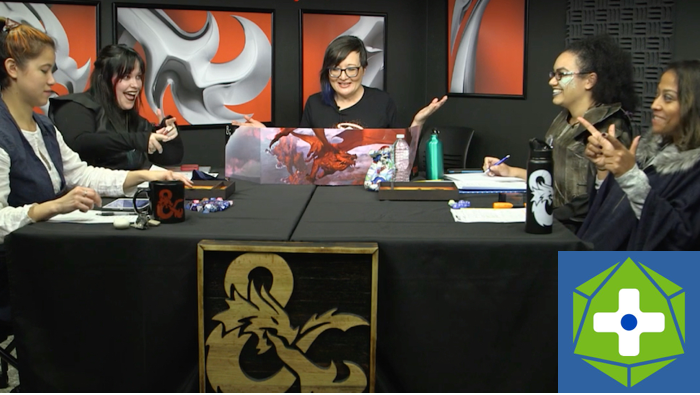 Kat Kruger & Jen Vaughn from d20 Dames stop by the studio to chat with hosts Greg & Shelly about their D&D podcast, co-working together, and more.